Carbonized bamboo fencing has a slightly darker caramel color than natural fencing, but is still lighter than mahogany and black. Its color is achieved through a heating process instead of stain that could damage the product. 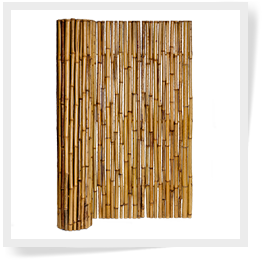 Carbonized bamboo fencing, unlike natural bamboo, offers you more of a contemporary and modern design. This type of fencing can be used both inside and outside of the home and garden. On top of being ecologically friendly, it is DIY friendly as well. It is easy to install and can be custom fit to suit your needs, be they decorative or just to add some privacy to your backyard. Carbonized bamboo is made by processing natural bamboo and making sure that it is worm free and mold proof during the process. Carbonized bamboo poles are then molded together to create bamboo fencing. This fencing can be ordered in any size to suit your needs. Its anti-corrosive nature makes it a favorite amongst consumers and a great option instead of traditional home building materials. Carbonized bamboo can also be used for flooring or as roofing to your gazebo or patio, to give a more organic look to your home and garden space. When used as flooring, their look is so similar to hardwood flooring that you may not even notice the differences. Bamboo flooring is one of the many sustainable stylish design options available today. Carbonized bamboo fencing can be implemented into many of your projects. Sizes include: 1" X 3' X 8’, 1" X 4' X 8’, 1" X 6' X 8', and 1" X 8' X 8'. 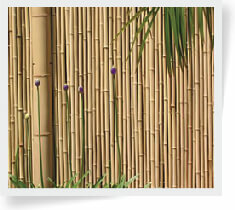 Like natural bamboo fencing, carbonized bamboo fencing is a material that offers a contemporary design. Your home can get the most benefit from our sturdy products and shipping that’s fast and free.